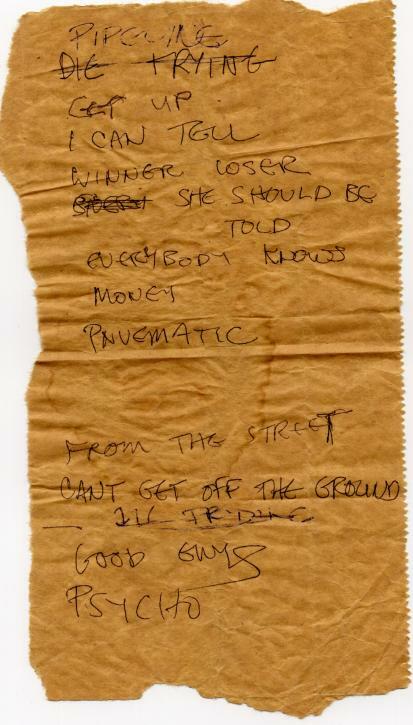 Set lists are instant artifacts; hastily scribbled out on a scrap of paper before a gig (I used to use old band fliers). 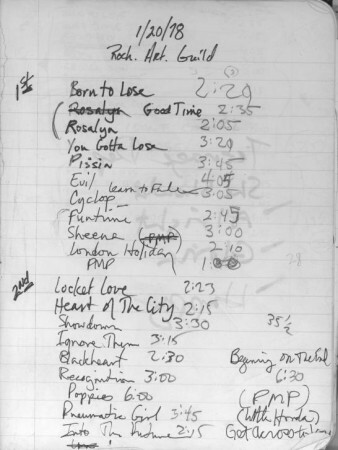 Typically, after the band had loaded in and finished their sound check, you had a little time left to scratch out a set list before the audience filtered in and then hand copy it out for other band members, unless you were organized enough to put together one before the gig! If you were the second or third on a bill then you could luxuriate in the dressing room drinking beers put together a list of songs (or, if you were Debora Iyall of Romeo Void, you would get your set together while downing two dozen of Scorgies’ finest Buffalo wings). If your band was on the bottom of the bill, however, you didn’t have much time to commit your list to paper (especially if you were a “Last Minute Larry” like me). 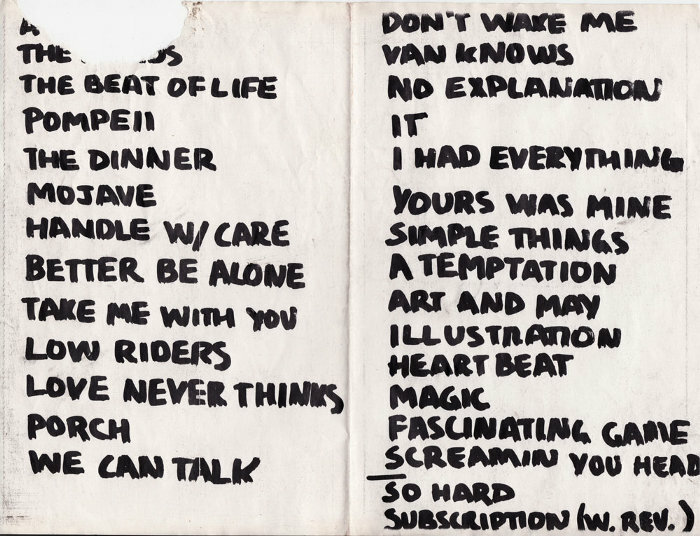 I’ve acquired a few set lists from New Math, Personal Effects, Hi-Techs, The Press Tones, The Projectiles, The Cliches, Bowery Boys and Invisible Party. I’m certain that a few of the Scorgies alumnus among us will be printing them out and trading them with their pals. Check them out after the jump. This one, from the Press Tones, was written on a heavy piece of art paper. Print it out and compare it to the one they’ll use at the Reunion! 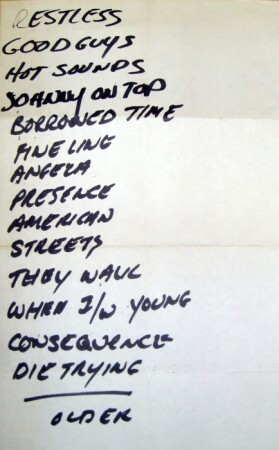 An excellent example of a hastily written set list. Looks New Math was either brown-bagging it that night or was into recycling back in those days. Given the dim lights of a nite club this must have been hard to read! 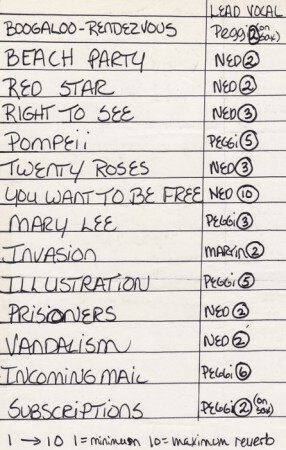 This set list, which came to me labeled “Rochester Art Guild 1978” denotes the playing time penciled in alongside each song. Bands had to conform to club owners time constraints back in the day (see Robert’s earlier post on New Math). Gathering together material for three sets was quite an undertaking, especially if youe were trying to squeeze in as much action as possible! The Scorgies DIY ethos changed that tradition for good. 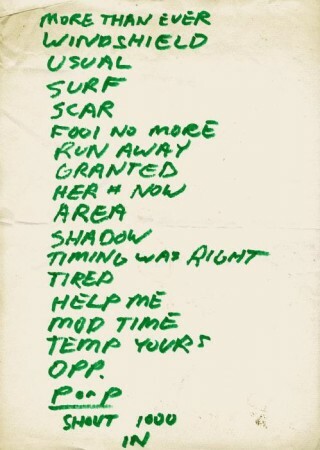 Lessons learned: this New Math set list is much more legible. Looks like Kevin (or Gary) started to write the list using a ball point pen then switched to a magic marker. Much easier to read from a distance! Okay, I see pattern emerging here. 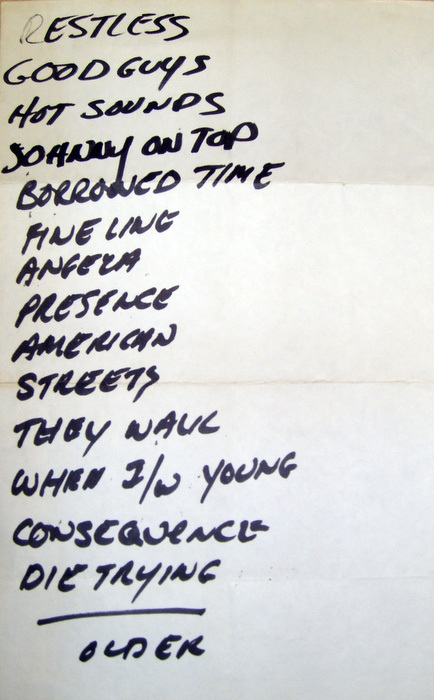 This set list from the Targets was “for the Chesterfield Kings (first gig) and New Math show – The Targets played the middle set.” You’ll note that Robert broke the set down into sections with each segment timed. It’s a meticulous approach but I wonder, as Robert noted in his comments about his New Math set list, whether or the song lengths were accurate when the Targets played before a live audience. Interestingly, Robert added that the show was videotaped and he has the tape! Peggi sent this to me and noted that the set list contained “reverb requests from sound man at Scorgies. Must have been one of our first gigs there.” I guess they must’ve gotten pretty comfortable with the sound engineers at Scorgies over the years. 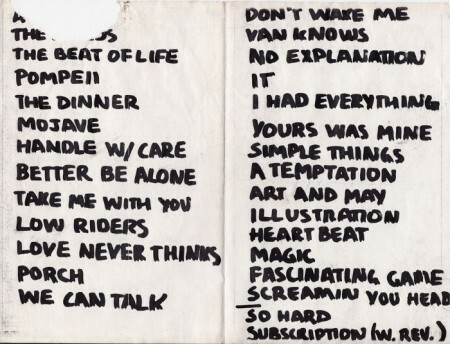 By the time this set list was created, it’s plain to see that Personal Effects didn’t need to add notes for the sound man. It’s great when you read a set list and can hear the songs in your head (and no, it’s not a sign of early onset dementia). 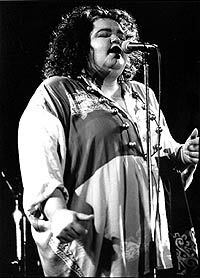 I especially loved their cover of Tanana Gardner’s Heartbeat, an R&B hit that was in heavy rotation on WDKX. It was a crowd pleaser, as denoted by its position in the encore. 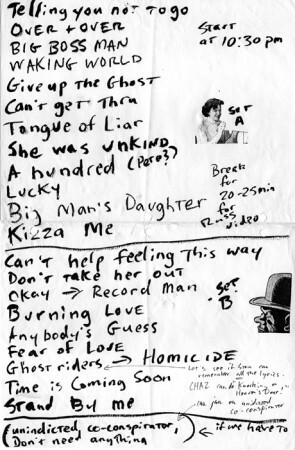 You’ ll notice in this set list that Porch has also moved to the encore as well, It wound up recorded and released as a single (backed with A Mess) that was distributed to concert attendees at the This Is It, Life Hereafter record release party. A set list is also useful, after a gig, to review what went well and is an excellent reference point to note the songs that went over well with the audience. 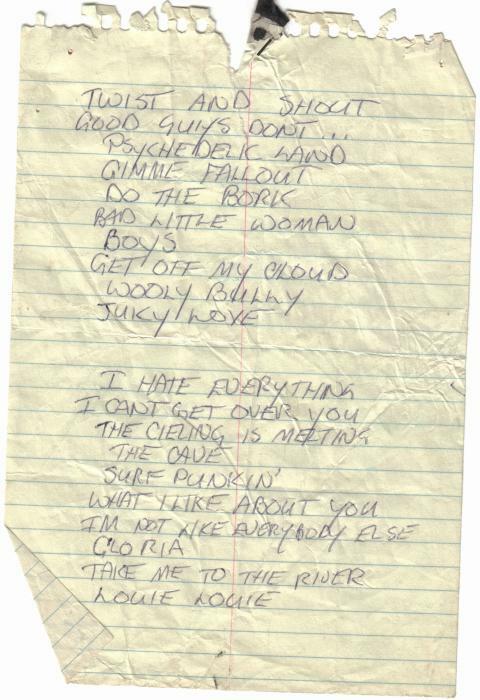 You’ll note that, among the songs checked off on this list, the Cliches went on to record Riverview Restaurant for the WCMF Homegrown Vol. 2 compilation. 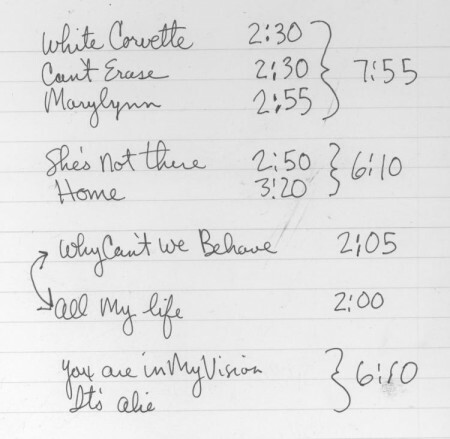 Of course, it was of equal importantance for every band to maintain a catalog of songs that they knew. Like the Chesterfield Kings before them, the Projectiles were hard-core afficianados of early psychedelia and obscure 1960’s era garage rock music. 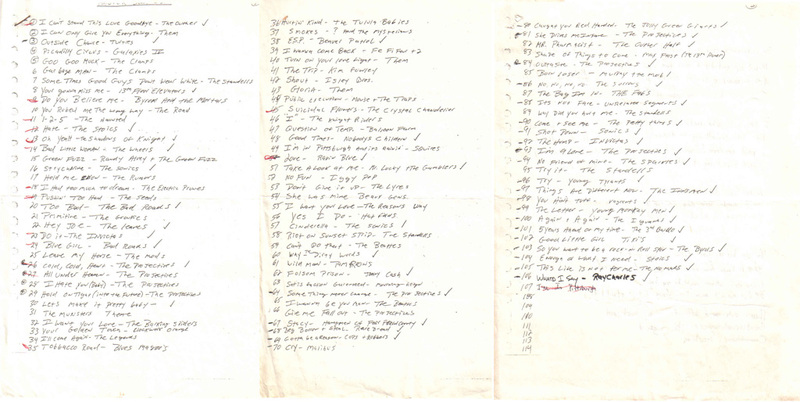 Its interesting to see is that this list denotes the sources of the songs they covered. After the Projectiles broke up, members would later form or become part of other 60’s fueled bands the Quatloos, Fertility Rite Brothers, Susan and the Surftones, the Riviera Playboys, Dan Frankand the True Believers and probably other too numerous to mention. Up to now, most of what I’ve written has been pure conjecture on my part. I’m sure there will be corrections and additions to this post. So in order to wrap this article up I offer up an Invisible Party set list from one of our last headlining gigs (the gig also featured the deubt of Russ Lunn’s War Music Dance) . In a departure from my usual style I actually composed this set list in advance of our gig then Xeroxed copies of it on sheets of 11 x17 paper. It contains a sarcastic note (to myself!) pertaining my inability to remember the lyrics to Ghostriders in the Sky . it seems as if I was also concerned about Pete Latham’s ability (he had just joined the band) to play on A Hundred, our first (and only) release on Jargon Records (after all, Lynne did have to teach him the bass part for the Beatle’s “Rain”). Also telling is the addition of the two songs at the bottom of the list. I was worried that we’d run out of material for a two set gig! Oh yeah ,someone posted ? 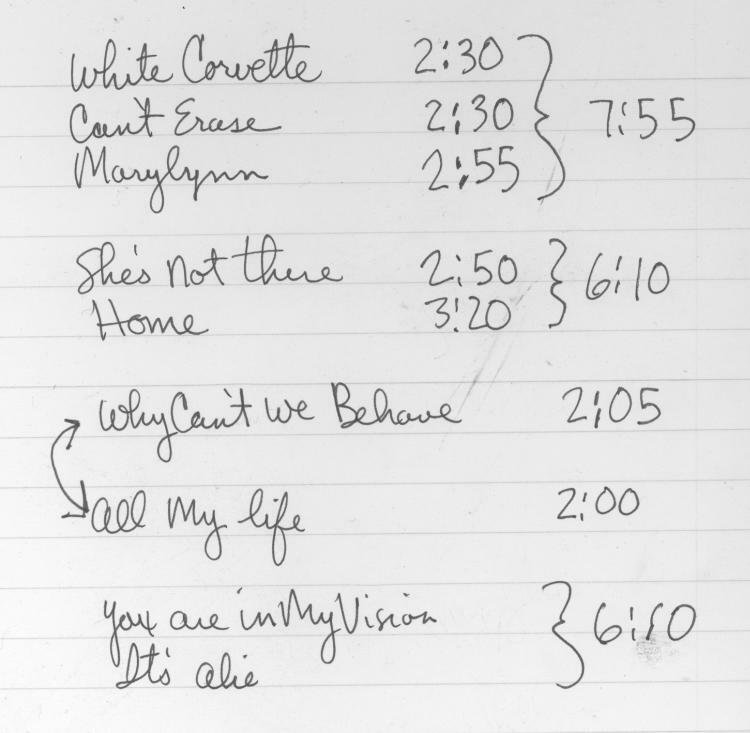 Regarding the New Math set list with times – this was from my composition book that I carried to every practice and gig. The timing was to get an idea of how many songs we needed. Early on, club owners required three 40-minute sets from a band (see Start Me Up entry in an earlier BLOG) – which never really happened when on stage. I remember a 40-minute set from Big Daddy’s that we played and played at practice – only to be done in 25-minutes once we were on stage playing for real. Thanks for the info Robert… I’ve updated the post. 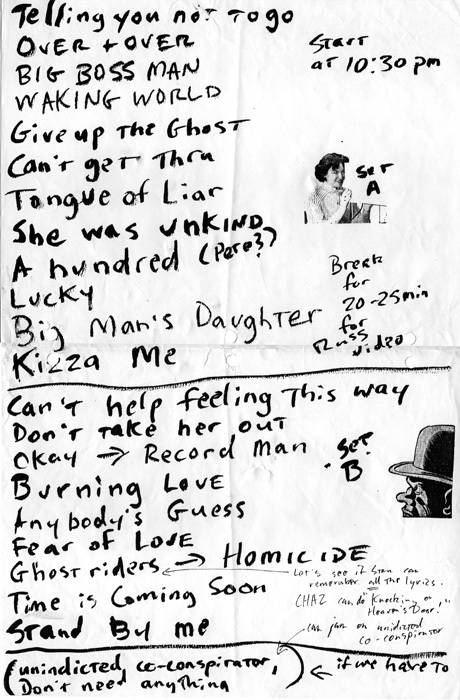 Why I still had the New Math and PressTones set lists in my arsenal of old Scorgies stuff is beyond me. I have more of their set lists in my stash than I do Cliches set lists. That’s weird. I hope I don’t have autographs, too. Speaking of set lists, The Grateful Dead played ‘Black-Throated Wind’ during their “retirement shows” on 10-19-74. They did not play it again live until 3-16-90. A 16-year hiatus! Now that is EPIC. Representatives from Packrats Anonymous will be on hand Friday night to discuss all this. No appointment necessary. 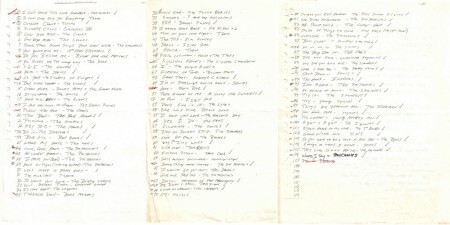 The Projectiles list of songs shows 107. I remember the book being closer to 350 songs that we had played! Must’ve been an early list, befor e the band purchased the remainder of the Pebbles and Back from the Grave albums! 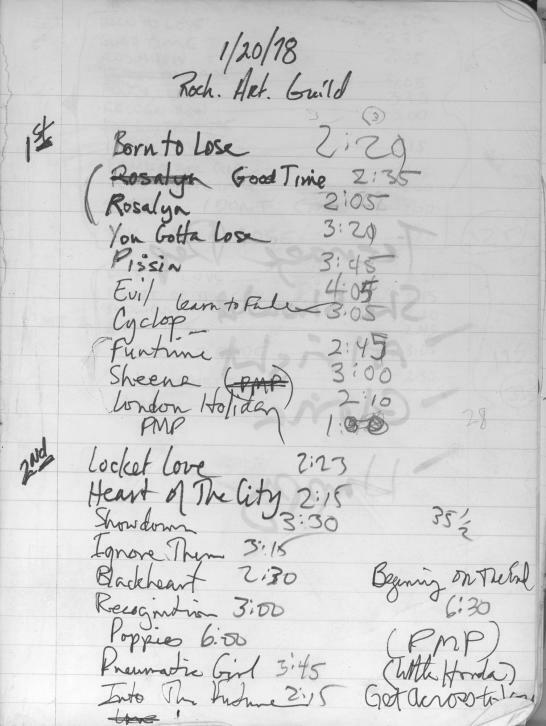 Hey Brian – The Projectiles catalog is an early version as evidenced by “Gimme Fallout” written by Dan Frank, possibly even before we even had our first drummer! You’re right – there were a bunch more! Thanks to everyone for all the great memories!